As a child this meant 2 things. The first of which was that the California school calendar was built in such a manner that my birthday typically fell 10-14 days before the start of the new school year. As fun as a Summer birthday might sound, I sorely longed to be one of 'those kids' whose mother brought cupcakes in for the entire class to celebrate, but timing meant it never happened. Second, and this is perhaps the most notable; every single birthday I would give my mother a nice long wish list of awesome toys and every year she would tell all of my friends' parents and my relatives that I wanted school supplies. I kid you not, a few years back I had a serious conversation with one of my Aunts who expressed that she genuinely thought I wanted a new backpack every year for my birthday growing up! It's not illogical for a parent to try and weave back to school necessities into their child's birthday when the two fall together. 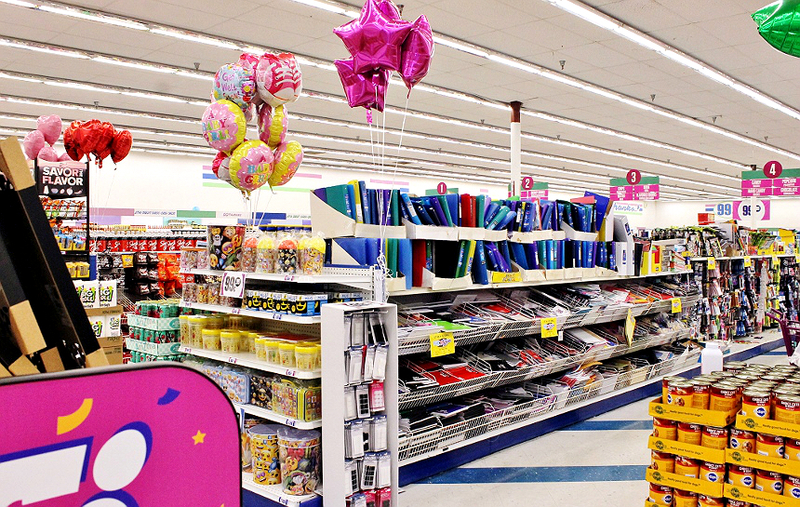 In fact, it's quite smart- but school supplies, and shopping, wasn't nearly as fun when I was growing up as it is today. Sure, Momma's generation had it much duller, but I also note a marked difference in what is socially acceptable (as far as self expression) when it comes to school supplies and clothing. Back in high school I was being a rebel with my neon orange backpack- today it seems unlikely that a student's gear wont be covered in bright colors, loud logos, and head turning artwork. Of course, statistically, there are way more students with birthdays post back to school than there are those falling over Summer break. But that doesn't mean that you can't put together a practical, and exciting, gift for the student in your life to help celebrate the coming school year. In fact I feel it is quite important to celebrate another year of learning, no matter the student's age, as it is a direct reflection of commitment to bettering one's self. Off the top of your head you probably have a few students in mind- usually the youngest in the family. However, when you really stop to think I bet you have a lot more students in your circles than you realize. Whether it's the first year of preschool, a high school student, or a single mother taking online courses, there are plenty of people gearing up for the Fall semester. And, no matter what type of education they're enrolled in, supplies are a must! 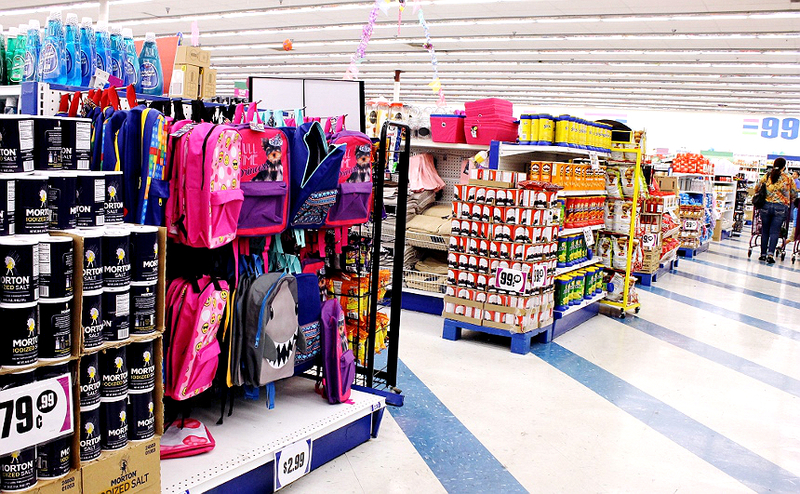 It's not going to shock you that, for back to school shopping, I shop my local 99 Cents Only Store. If you don't know by now the local 99 is much more than a place to go for amazing finds under $1. In fact, you'll find awesome high value items over $1, at extreme discounts too! And, of course, you'll find plenty of name brands you use everyday, as well as a complete fresh produce department, and jut plain cool finds you won't spot anywhere else. 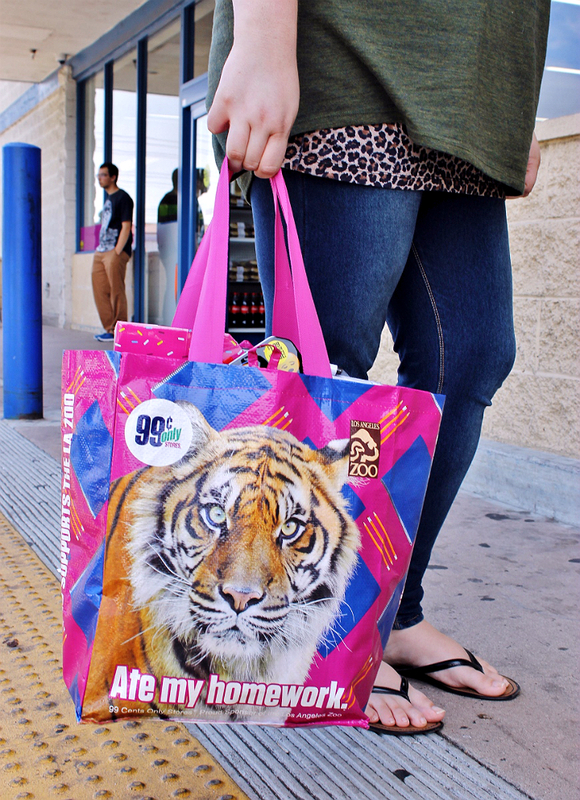 Shopping at the 99 is an adventure! My best tip to put together a back to school gift, for any age, is to shop the 99 because you will find an entire aisle dedicated to school and office supplies, as well as a store full of everyday essentials from pantry items (school lunches and snacks) to cleaning supplies (wet naps and plastic cutlery), and even some fun goodies to really personalize your gift (bobble heads, a new perfume, stylish water bottle, plush blanket, and more!) 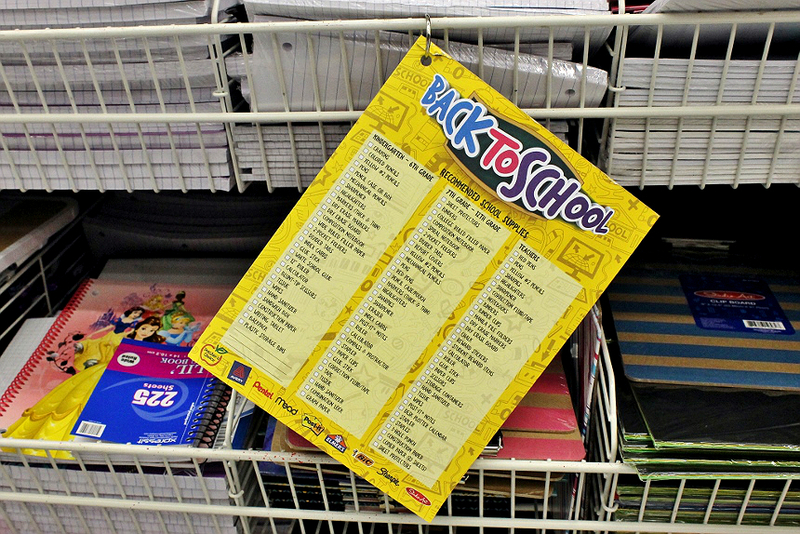 And, for those of you with K-12 students at home there's even a free tear-off back to school shopping list in the school supply aisle, to help you check off all of your necessities for the upcoming school year. So let's take a look at a few types of students and some gift ideas you can put together on a budget when you shop at the 99. You'll find plenty of adorable fashion backpacks at the 99 this time of the year- we saw several for $5 or less featuring everything from Paw Patrol to an adorable shark design. Whether the child you're shopping for has a backpack already or not it's always a great idea to pick up another backpack (especially at prices like these) as straps tend to rip and holes then to form throughout the year of wear and tear. Cute character backpacks are also a quick way to get a young child excited about going back to school, and can make the perfect gift bag for your other gifts. The next thing you'll want to do is pick out an awesome lunch box- which is just as much about showing off as a cool backpack. 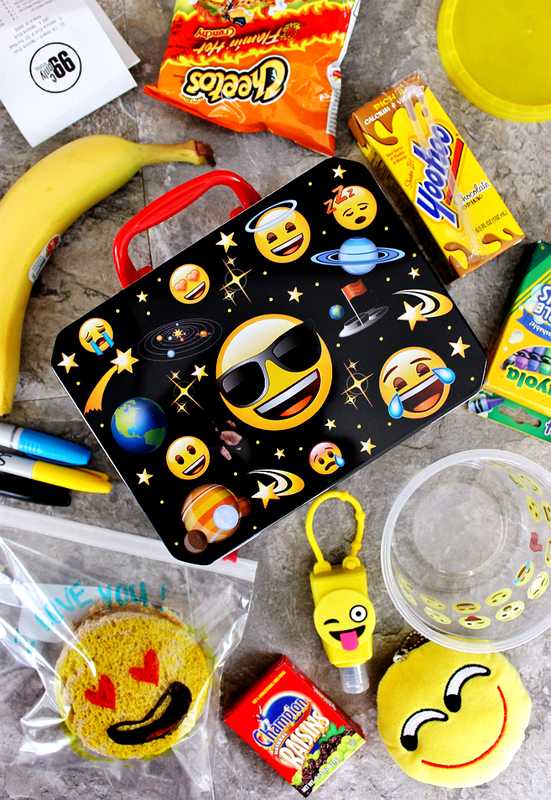 I chose to go with an "Emoji" theme lunch kit since our local 99 had well over 40 different products with these adorable emojis on them. 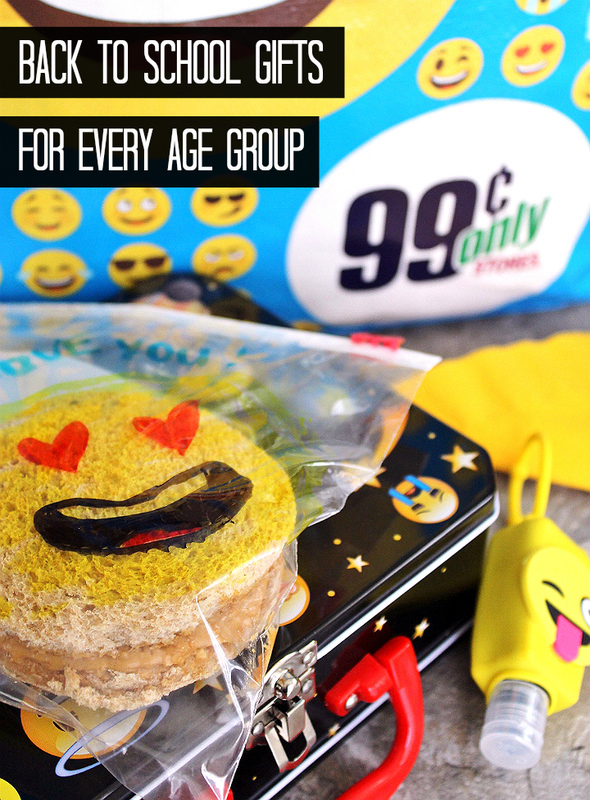 Emojis are very hot right now for any age, especially with the new movie coming out soon! Since the school year isn't quite here you will want to pick up shelf stable snacks mom will appreciate- boxed raisins, snack size chips, and fruit boxes will all be a hit. Then be sure to get some cute resealable snack containers for homemade lunches, a cute hand sanitizer (if age appropriate), some character wet wipes, and maybe a plush key-chain or two. Moms!- Want to really rock the upcoming school year? Pick up a package of colored permanent markers and some sandwich bags from your local 99. While you're there be sure to check out the selection of fresh fruit and veggies for nutritious school lunches. Package your homemade meals and snacks in the baggies and write notes of encouragement and doodles on the plastic baggies to inspire your student during the day! Tweens and young teens can be the toughest group to impress. They're very picky and even when they give you a specific wish list to shop with there's still a high chance they will have changed their mind by the time you've painstakingly located everything. 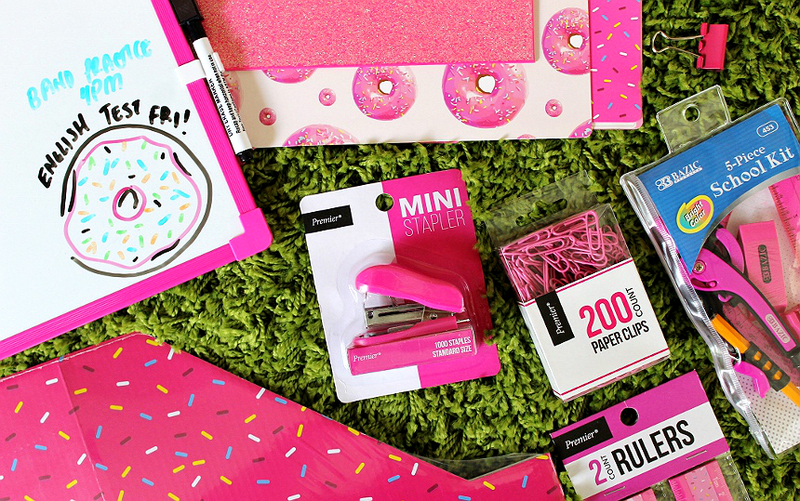 Luckily the local 99 has you covered with all things on trend and fleek right now- you'll find several complete collections of styled back to school essentials from pastel watercolor inspirations to Minions and (my favorite) pink frosted donut. These collections are located throughout the school supply aisle with the appropriate items (IE: rulers with rulers, pencils with the pencil display) so you might have a tiny scavenger hunt putting your collection together but there's plenty to choose from. And, any tween will tell you, you probably don't want EVERYTHING to be matchy-matchy, so you should also consider the color and theme of your gift bundle and pick up a few items that fit in but don't necessarily overload the sentiment. If there's one thing about being a teenage female student that tends to bite (pun intended) during the high school years it's having to tackle "that time of the month" in between sports and extra-curricular events and long days running between classes. Most adult women rely on a form of emergency kit to get through this monthly event, so it stands to reason your teenage student would love to have a toolkit of their own to fall back on. Of course you don't want to completely alienate and mortify your teenage student- so be sure to air on the side of either complete discretion, or cheeky humor as you feel your student will be most receptive. 99 Cents Only Stores have plenty of little travel totes/mini makeup bags to choose from to act as a convenient and unsuspecting vessel for your thoughtful collection of items. Or you could go tongue and cheek and pick up some paint, hot glue, and felt from that school supply/crafting aisle and give your emergency kit a little facelift. 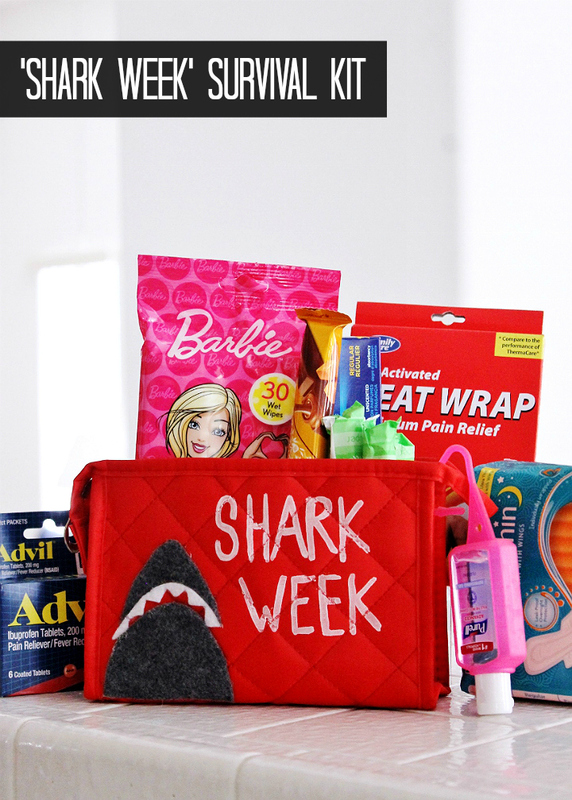 We find 'Shark Week' to be aptly appropriate this time of the year, and hilarious during that time of the month. Gift for college students perhaps offer the most versatility. There are a lot of things to consider when it comes to the specific student's needs- Will they be staying in a dorm? Will the bulk of their classes be in lecture halls or online? What amenities are near their campus? What will they be studying? College is NOT considered a mandatory schooling commitment. The choice to attend secondary schooling is ultimately one made by the student (finances allowing) and should be heavily praised and celebrated. It's a commitment to better one's life, and the potential life of one's family down the line. For this reason I especially love putting together gift baskets for college student family members and friends. Since we still have wiggle room in our budget (having spent under $15) we also threw in a 99 Cents Only Stores gift card. We're pretty sure the gift card will be the star of our gift- since you can find pretty much anything you're looking for at the 99, but that blanket is pretty sweet too! So there you have it, why a new school year is something worth celebrating- and how to absolutely rock the celebration of it with amazing gifts on a budget. I daresay if I'd gotten any of these gifts growing up under the guise of my 'birthday gifts' I would've been a little less grumpy about sharing my birthday with the start of a new school year! Be sure to grab our free printable shopping list for back to school gifts for any age, and head into your local 99 now- there's new inventory always being added, and the best finds sell out quick, so don't delay! 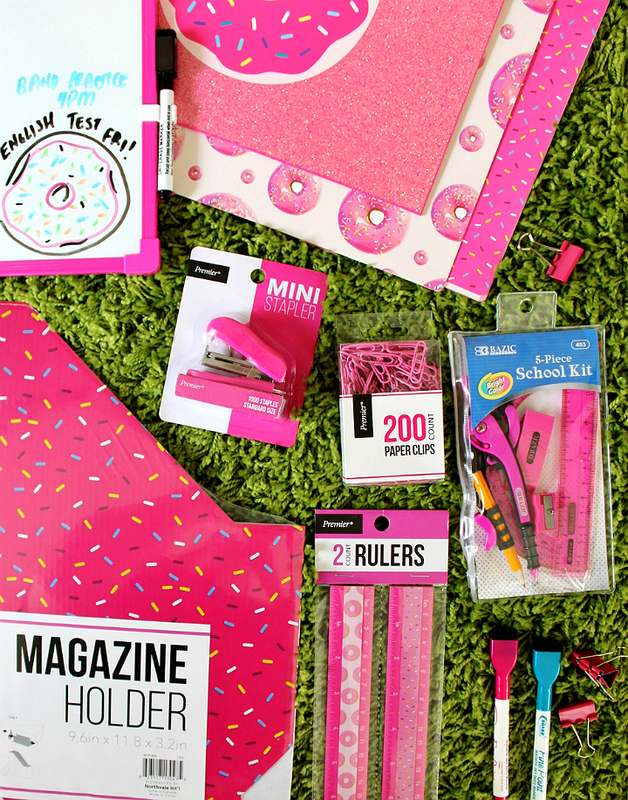 Visit the Social Hub for more creative back to school season ideas, and be sure to follow the 99 on Facebook for awesome ideas and finds all year round! 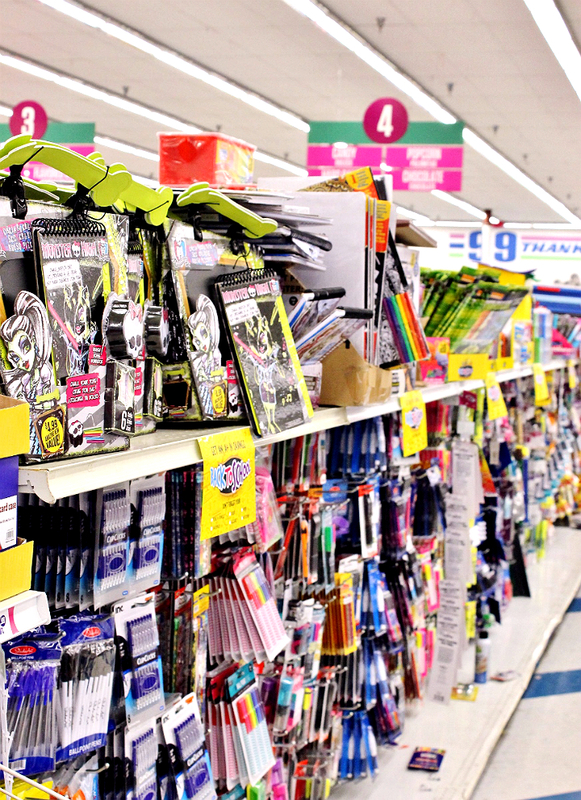 Now, tell me, what was your favorite thing to buy when shopping for back to school each year, as a student? Shies...now thats a bigger ball game! For my kids-its always been the latest style of clothes.